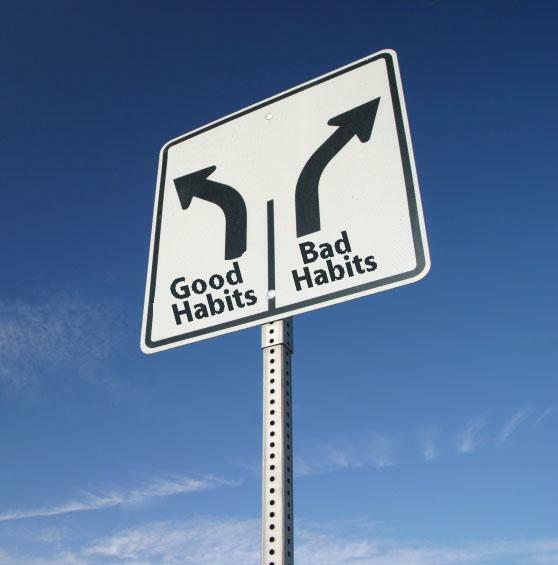 We all have a lot of bad habits. Bad habits that we’re constantly trying to get rid of. We go to classes to learn to speak up more, or less. We set New Year’s resolutions to eat less cake (and lose fifteen pounds) or to speak up more (or less), because the class alone didn’t cut it. We decide we will play a more active role in group decisions at work or delegate more. But our bad habits often stay with us, much to our disappointment. We all try and form good habits. We promise to exercise three times a week and elicit the help of a workout partner or personal trainer – someone to hold us accountable until we can make a “habit” out of it. We challenge ourselves to make a habit out of speaking up in meetings, or being more organized, or always having financial information when necessary. We try to make habits out of everything and anything that will help us get ahead. But there is one habit that is often frowned upon and overlooked, but that can help you move forward in nearly all aspects of life. Having fun. Somewhere between birth and adulthood (unless you’re like Peter Pan or Willie Wonka, and have decided to never grow up) many of us lose our ability to have fun. Whether it’s squelched out of us, or we choose to actively deactivate our fun meter, we lose the habit of having fun. We even frown upon it and think we’re somehow more important and effective if we’re always serious. It’s wrong. It’s wrong to think that fun is bad. It’s wrong to think that laughter and frivolity make us less productive. While too much laughter and frivolity does limit our ability to get things done, research has shown that lightness, laughter, and fun in our lives and our work actually fuel us for more innovation and productivity, as well as strengthen us to keep going. Come on, how much more do you enjoy what you’re doing when you enjoy what you’re doing. It’s that simple. And it’s something that we can practice. Companies are acting on this research – the break room in a Best Buy in New York City has two giant hi-def TVs, a foosball table, and videogames. At ThinkGeek.com they’ve added guitars and a “claw-machine” (the arcade game where you drop a large claw onto a pile of plush toys and try to scoop one out). And there’s no reason you (and I) can’t find ways to bring in our own fun, even if our company won’t sponsor a foosball table. So have fun. Find things to laugh about. Share funny stories. Enjoy the guffaws and the snickers and the crinkling of the eyes. These all bring us closer to our colleagues, give our brain a rest from all our stress, and are simply fun! Where can you have more fun? How can you make it a habit? Have fun. Pick one fun thing and do it NOW! How are you having fun? For support for having more fun at work and in life, contact Robyn at rmcleod@chatsworthconsulting.com.